With this match, once again many records were set and broken and we bring you some interesting statistical highlights from the match. Team India pulled off another victory in the Twenty20 International (T20I) series and whitewashed Australia in their own backyard for the first time ever. This match was not like the previous games, as this time India were chasing rather than defending a total. Much like the fifth One-Day International (ODI), this time too India won while chasing. Incidentally, both matches were played at the Sydney Cricket Ground (SCG). With this match, once again many records were set and broken. As always, Abhishek Kumar brings you 14 interesting statistical highlights from the 3rd T20I of the series at Sydney. 1. Batting first, Australian captain Shane Watson scored his maiden T20I ton and remained unbeaten till the end on 124. This is now the highest individual score by any batsman at Sydney Cricket Ground (SCG) in T20Is. 2. Watson also became the first Australian and 10th player overall to have scored hundreds in all three formats of the game. 3. His 124 not out is now the highest score by any batsman against India in T20Is. 4. Watson is also the only captain to have made century on his T20Is captaincy debut. 5. India’s top-order batsmen Rohit Sharma and Virat Kohli put up a partnership of 78 runs, which was their fifth fifty-run partnership in T20Is. With this, they have levelled with MS Dhoni and Yuvraj Singh in terms of most fifty-plus partnerships for India in T20Is. 6. Watson’s unbeaten innings of 124 is now the second-highest individual score by an opener in T20Is. The highest score is 156 by the man Watson replaced as captain for this match, Aaron Finch. 7. India chased down the target of 198, which is now the highest successful run chase in Australia in T20Is. Overall it is the seventh-highest successful run chase in the history of T20Is. India also make two appearances in the top five. 8. Watson faced 71 deliveries in his knock, which is the highest number of balls faced by any batsman in T20I match. 9. Watson also became the first player to score a hundred and to take a wicket in the same T20I. 10. Australian pacer Shaun Tait conceded 24 runs off his second over of the match, which is now the third-most expensive over bowled by any bowler against India in T20Is. The other two are Stuart Broad (36 runs) and Rory Kleinveldt (25 runs). 11. Virat Kohli scored three back-to-back fifties in the three T20I series against Australia, and became the first player to do so in a bilateral T20I series. 12. 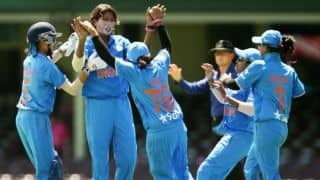 India whitewashed Australia 3-0 in the T20I series and became the first team to whitewash Australia at home in a three-match series in any format since 1877. 13. Both Australia and India scored a lot of runs in their first six overs. Australia scored 57 and India made 74, which is now the most runs scored by both sides (131) in the first six overs of a T20I in Australia. 14. With this 3-0 series victory, India raced to the top spot in the T20I rankings, while Australia fall down to eighth position in the rankings.